It’s dirty nail season. This time of year, I have a hard time keeping my fingernails clean cause I am digging in the earth! I’m ready to start the season out right and that means focusing on the soil under my fingernails. Soil is the main ingredient to your growing success. Nutrient-depleted soil produces a poor crop, whether it is the front lawn or vegetable garden. Last year’s crops devoured the soil nutrients as they grew; soil breaks down and weakens if not replenished. Test the soil every year. This will be your gauge for nutrient management for the year. Add organic matter. 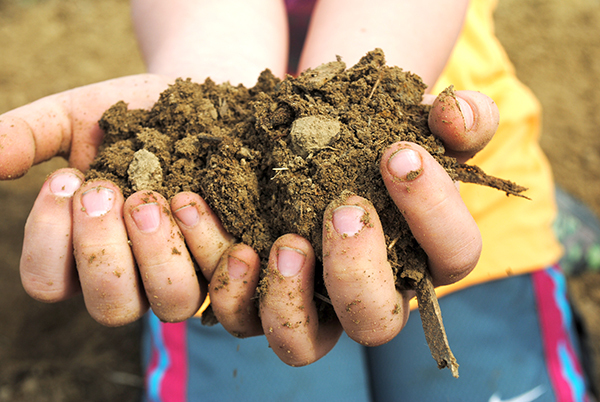 Organic matter is a wow factor for soil. It improves the overall soil structure and provides the right environment for bacteria, fungi and earthworms, which help break down plant material. If you don’t have your own compost pile of organic matter, you can purchase compost at your local garden center. Add fertilizer. If the soil test showed a deficient nutrient level, add fertilizer to the lawn and garden accordingly. Be sure to follow label directions! Don’t work wet soil. Working the soil when it is too wet causes compaction and can damage the soil structure. This can take years to repair, so resist the urge and wait until the soil is dry. If the soil crumbles through your fingers, it’s dry enough to work. If it forms a muddy ball, let the soil continue to dry. Plan to plant a cover crop in the fall and a “green manure” cover crop in the spring. I plan to plant a “green manure” this spring and see for myself how it works. Don’t let the name fool you, green manure refers to the sowing of annual rye grass, annual clover or hairy vetch into the garden. Once it has sprouted and is growing well, it is tilled under. The green manure will break down and release its energy and nutrients into the soil for the new crop to feed upon. Are you ready to get those fingernails dirty? If so send me a picture of your dirty nails on Twitter or Instagram!! If you have had success with green manure, let me know about it! Welcome to the dirty nail club!